Starting with top line (generally referred as sales/incomes/revenues etc.). Adjusting top line with respect to related costs and expenses whether direct or indirect (whether recurring or non-recurring), we arrive at pre-tax income. Finally deducting the tax expense (generally referred as Corporate Tax as per statutory norms) from pre-tax income we arrive at the bottom line (generally referred as Net profit/Net Earning/Net Income etc.). 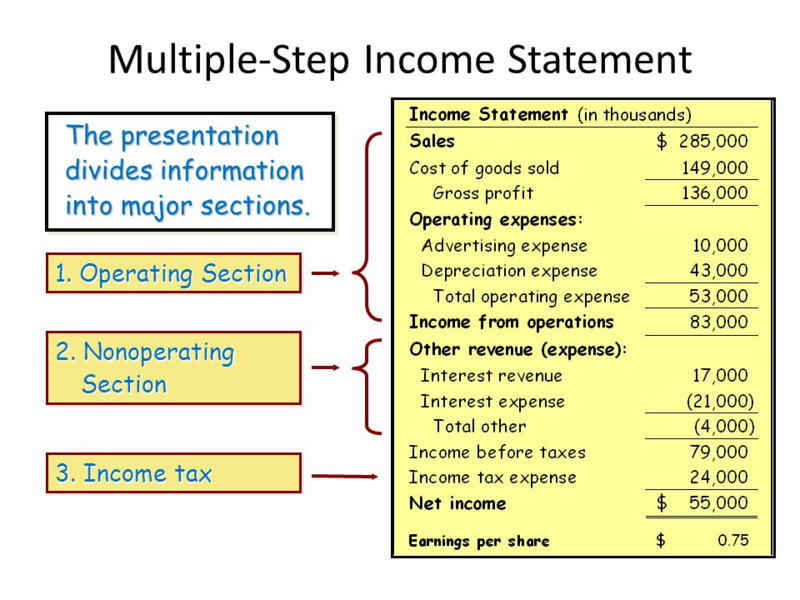 In this article we are going to elaborate major components of Income statement with respect to operating as well as non-operating income and expenses. To recognize the operating income of a company, there is a need to understand the business fundamental of that company. It is the income that a company’s earning/losses from its core operations of their business. For example: Ashok Leyland company is in business of manufacturing vehicles i.e. Trucks, Busses, light vehicles, Services & Sale of the spare parts for their core products (i.e. vehicles they manufacture) etc. Incomes generation form these major heads after deducting related direct and indirect costs are treated as operating income. Operating Income also be known as EBIT (Earnings before Interest and taxes) as well as can also be referred as EBITDA (i.e. the cash operating profit before adjustments of Depreciation & Amortisation). Operating Income is used to evaluate the earning performance of the company horizontally (for analyzing its historical trends) as well as vertical (for comparison among other companies in peer group). The major earnings performance metrics are EBIT margin % & EBITDA margin %. For valuation purposes operating earrings/income is also a useful tool for comparison purpose among other companies in peer group. The major multiples are used in terms of valuation are – EV/EBITDA; EV/EBIT etc. The expenses which are beyond the nature of “Cost of Goods Sold” i.e. “manufacturing cost”; “carriage inward costs”; “cost of raw materials”; “Inventory management costs”; “trading costs”; “Packaging costs” etc are termed as Operating expenses. Such expenses are generally classified under “Selling expenses”; “General and Administrative Expenses”; “Research and Development expenses”; “Depreciation and Amortisation” etc. are termed as Operating Expenses. Apart from that there are other expenses, which are not classified under above mentioned heads of operating expenses, are classified as “other operating expenses”. Salaries and commission to sales persons; payroll taxes and other benefits; Advertising and Promotional activities; other departmental administration costs, etc. Salaries or wages of Administrative staff; Rental expenses; Insurance expenses; office supplies and subscriptions expenses; consultancy services (for financial services, legal services, business promotional services etc); Depreciation and Amortisation on Office Equipment’s etc. Any other expenses which are operating in nature but not under the purview of above-mentioned operating expenses and generally referred as overhead expenses. These expenses are not directly chargeable to revenues or classified under COGS e.g. outsourcing costs; operating leases expense; maintenance related expenses; bank and postal charges etc. R&D expenses are usually incurred by company even the outcome of the research has not been put into account for generating revenues. Research and Development expenses are either integrated with Selling General & Administrative expenses or reported separately. In Income statements there is another head of incomes which are not directly related to core operations of an entity or day to day operations of the company. These incomes are generally on incidental basis i.e. on non-recurring basis. These heads generally referred to earnings from other sources e.g. Gain from translation of foreign currency transactions; etc. Loss from translation of foreign currency transactions; etc. Non-operating incomes & expenses both can affect the bottom line of an income statement either positively or negatively based on amount of Income or Expense. For example, non-operating revenue may artificially increase profit margins whereas expenses reduce it. Hence to nullify these impacts, there is an exclusion of non-operating income and expenses from income statements with respect to the most common accounting approach. This helps Analyst’s to portrait a more accurate picture of operating efficiencies of business/company. Income statement analysis determines a company’s earnings performance and also provide outlook potentials with respect to its historical trends, providing an insight of how the company conducts its business in past. Adjusted EBIT = Reported EBIT – Reported non-operating incomes and expenses (if any reported above EBIT). Adjusted EBITDA = Adjusted EBIT + Depreciation & Amortisation.